Facial Palsy or Bell’s palsy is a condition that affects the facial nerve usually just on one side of the face leaving paralysis. Often initial diagnosis is stroke as the symptoms are slurred speech, the start of facial paralysis, drooping of the face and mouth on one side of the face, inability to close one of the eyelids. Our task was to create medical illustrations of the nerve and the associated anatomy regarding Bell’s palsy for use in patient education by an association called Facial Palsy UK. Facial Palsy UK is an association that deals with Bell’s palsy and they are an committed association where suffers of facial palsy not just Bell’s palsy can go to receive the best information, treatment and support available. It provides a vital service as it is one of the very few specialist associations for facial palsy. Bell’s palsy is something we are very aware of as the artists husband Tim Butler suffered with the condition a few years ago and within the same family a niece at aged just 1 years old. Tim attended Facial Palsy UK and was treated by Dr. Nduka. Tim still attends the group today and through this association with Facial Palsy UK we were commissioned to create some illustrations. Their purpose to be used as part of the educational tools used by the surgeons and doctors when dealing with patients and Bells’ palsy sufferers to help a doctor explain to a patient which nerves have been affected, which muscles are affected and why. Bell’s palsy is named after Sir Charles Bell, a 19th century Scottish surgeon who was the first one to describe the facial nerve and its connection to the condition where temporary weakness or paralysis of the muscles is on one side of the face. It is the most common cause of facial paralysis but despite that not many people are aware of it and medics can be slow to diagnosis it. 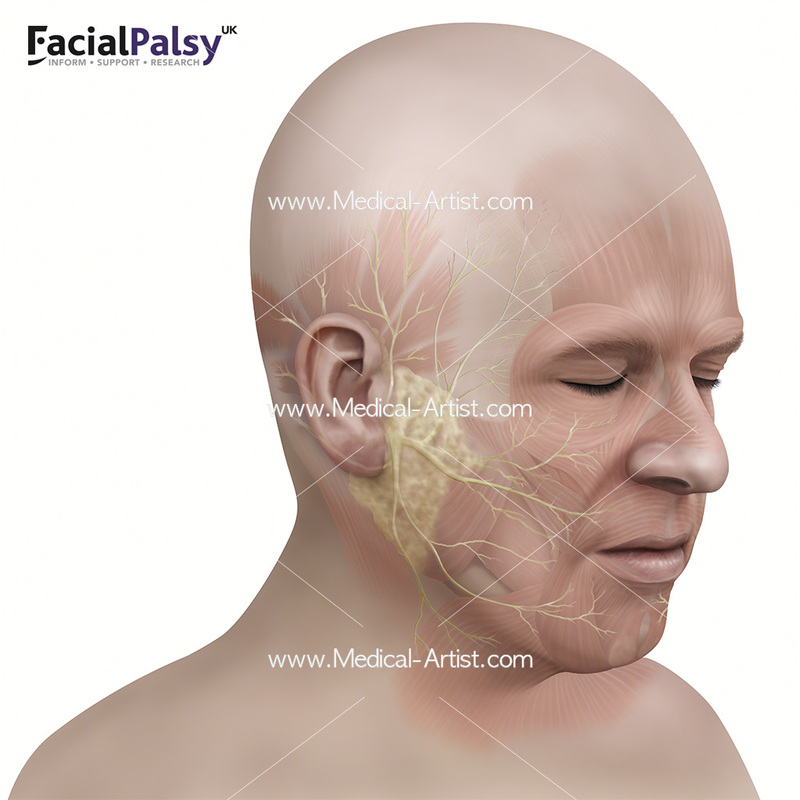 Maybe this is because facial palsy can be the result of multiple causes such as disease, injury, stroke, birth trauma, cancer, or neurological condition and in all these conditions it affects the nerves that supply the muscles to the face. That said early diagnosis of the condition can have a huge impact on recovery and if treated with steroids. Treating the inflamed nerve early on gives it more of a chance of not being damaged beyond repair as recovery of the nerve can take as little a two weeks or up to 2 years or in some cases recovery is never at all. 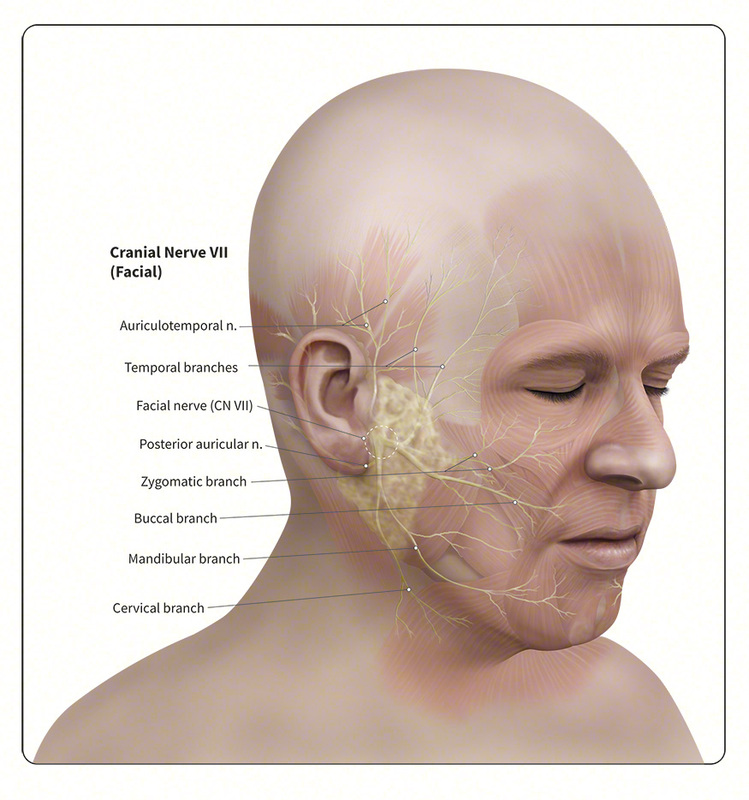 Damage to the nerve (Cranial Nerve VII) occurs when the nerve becomes inflamed causing it to swell. The course of the intracranial nerve through the cranial cavity and the cranium itself causes it become trapped within the small hole or foramina going out of the skull. As the nerve gets trapped and swelling continues the nerve can become completed severed. This is why early use of steroids is so important because the steriods reduce the swelling quickly and can lessen the damage to the nerve giving it a much better chance of recovery. In Tim’s case he was not diagnosed for four days and subsequently his face took two years to recover and treatment will be ongoing receiving botulinum toxin injections. These injections help to control any nerves that have grown back in the wrong order, so you smile for example and only one eyebrow moves. This is why we were so pleased to provide Facial Palsy UK with some illustrations because we know from first hand experience just how great a charity they are. Working with Dr. Nduka and the Facial Palsy team we were able to provide illustrations that would be used directly with patients and we find that a very satisfying outcome. Facial Palsy UK are a terrific team offering support and treatment to some very needy patients.